Students will tackle the problem of radiation for astronauts aboard Orion (Credits: NASA). NASA unveiled an Exploration Design Challenge on Monday [March 11] to give students from kindergarten through 12th grade the opportunity to play a unique role in the future of human spaceflight. The innovative educational opportunity was announced in a special event at NASA’s Johnson Space Center in Houston. The challenge asks students in the U.S. and abroad to think and act like scientists to overcome one of the major hurdles for deep space long-duration exploration — protecting astronauts and hardware from the dangers of space radiation. This education-focused effort was developed through a Space Act Agreement between NASA and Lockheed Martin Corp. of Bethesda, Md., in collaboration with the National Institute of Aerospace in Hampton, Va. The goal is to help students see their role in America’s future exploration endeavors. The announcement took place in front of a full-size Orion replica at Johnson’s Space Vehicle Mockup Facility. Orion is the spacecraft that will take astronauts to deep space destinations in the future. NASA Administrator Charles Bolden, NASA Orion Program Manager Mark Geyer, Lockheed Martin CEO and President Marillyn Hewson, and NASA Associate Administrator for Education Leland Melvin were at the event. They were joined by local teacher Amber Pinchback, who offered an educator’s perspective on the value of NASA missions and programs and how they benefit science, technology, engineering and math (STEM) in the classroom. “Space exploration has inspired and fascinated young people for generations, and the Exploration Design Challenge is a unique way to capture and engage the imaginations of tomorrow’s engineers and scientists,” Hewson said. The first Orion test mission in space is called Exploration Flight Test-1 (EFT-1). The mission is set to lift off in 2014 from Cape Canaveral Air Force Station in Florida. Melvin, a two-time shuttle astronaut, explained the details of the challenge and shared why hands-on experience and involvement is an effective catalyst for engaging young minds in the future of America’s human spaceflight program. NASA is planning for longer human space exploration missions outside the protective blanket of Earth’s atmosphere and magnetosphere. 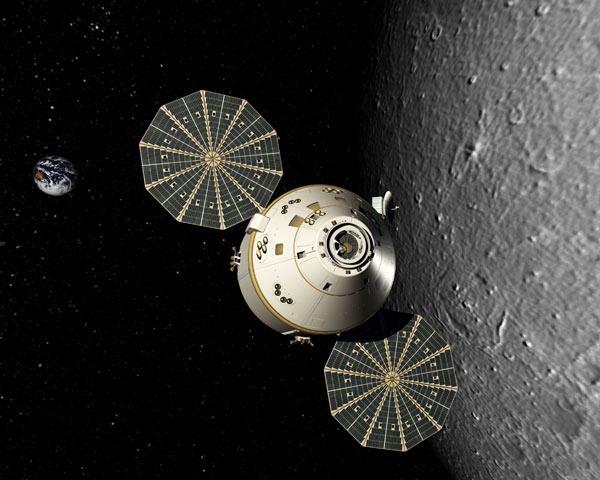 NASA, Lockheed Martin and other partners are developing the Orion spacecraft to carry astronauts farther into space than humans ever have gone before. To do this, materials must be engineered for the spacecraft that will better protect future space explorers from the dangers of space radiation. In 2017, NASA’s Space Launch System heavy-lift rocket, currently in development, will send Orion on a flight test mission around the moon. NASA’s Exploration Design Challenge brings cutting-edge learning to educators and students using standards-based activities, as well as print and video resources developed by leading education experts. Students taking part in the challenge will discover how to plan and design improved radiation shielding aboard the new spacecraft. Younger students, in grades K-4 and 5-8, will analyze different materials that simulate space radiation shielding for Orion and recommend materials that best block harmful radiation and protect astronauts. Students in grades 9-12 will learn about radiation and human space travel in greater detail. Using what they have learned, they will be asked to think and act like engineers by designing shielding that protects a sensor on the Orion capsule from space radiation. I can imagine that the radiation levels on board orion will be significantly problematic, so it’s a great area of study!